Recommended citation: Varvantakis, C. and Nolas, S-M.(2018). ‘Multimodal ethnographies between curation and experimentation’, entanglements, 1(2):1-6. A second issue of entanglements is ‘at hand’, on screen, online. An issue for which we are particularly happy, with regards both to the breadth and diversity of the themes covered across the various articles as well as with the willingness of the authors to engage and experiment with ways of working multimodally and/or to reflect on such practices. Furthermore, this is an issue that emerged through the responses we received to our inaugural issue, expressed in submissions, messages of support and offers for assistance by colleagues around the globe. In discussions among us, we have been trying to decipher what this interest and momentum connotes. We tend to think that these responses suggest, on the one hand, that multimodality is now well and truly embedded in ethnographic practice, but perhaps also that multimodality may be a useful way to look at ethnographic practice, a lens through which researchers reflect on their practices, and one that may be helpful in their analyses too. Two themes run through this issues of entanglements: curation and experimentation. The articles in the expériences section tell a tale of different multimodal curatorial practices by ethnographers (i.e. Walton, 2016). Panayiotis Panopoulos’ article on migration and memory tells the story of an ethnographic journey which started with a chance find of 19 10-inch 78 rpm records in the Athens flea market by an artist known to the author. Together they go in search of the voice scratched onto the records, the memories and feelings it invokes, and the kinship ties in (re)produces. Panopoulos’ article is a careful curation of audio sounds, visual documentation of the meetings of the recorded voice and family members, as well as evocative prose that recounts a journey across historical time and two different continents. It is also an example of what happens when ethnography mets and engages with artistic practice and the unexpected and multimodal journeys that can emerge. Pafsanias Karathanasis’ and Konstantina Kapsalis’ video and photo/essay assembles scattered slogans, stencils and other unauthorised interventions on the walls of Mytelene, Lesvos’ capital. Curated in this way, the graffiti created by local and international activists tell a story of what the authors call ‘emplaced activism’ and provide a counter-narrative and challenge to officialdom, state and international narratives of the reception crisis on the island and beyond. Katerina Sergidou, in her piece ‘Can I sing you a carnival song?’, curates a tune, her own memories of it, and the mediation of her memories and senses through her communication with interlocutors on different online platforms. Her contribution captures something of the spirit of experimentation that underlies multimodal ethnographic practices as she recounts the process of tuning her ethnographic ear, learning to hear different stories of contestation as well as the embodied rhythm of the pasodoble ¾ . Finally, Amy Mulvenna’s contribution is a reflection on the use of experimental photography as a way of walking the tightrope between anonymity and acknowledgement of participation in ethnographic research. Her article describes the process of shadow photography with 7-11 year olds in Northern Ireland. It also curates a number of the generative and playful images created by the group telling the stories behind each. The curation theme is continued in the re-views section where Marta Cenedese reviews the multimodal photo-journalistic project Finding Home, that embeds elements of ethnographic practice such as walking alongside refugees in this case, who travel from Syria to various European destinations. 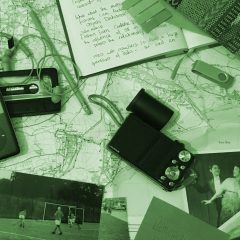 The project assembled and curated through the use of a range of media (photographs, videos), online and face-to-face meetings, and provides food for thought about how multimodal ethnography might be re-presented to broader audiences. The theme of curating and disseminating multimodal ethnography is also the focus on Kirrily Pells re-view, who writes about the in common: children’s photo/stories of public life exhibition put on in London (Athens and Hyderabad) by the ERC funded Connectors Study. Kirrily’s review focuses on the ‘earliest political memories’ collected and illustrated by the study, and her review explores the relationships between childhood, memory and temporality that such curation invoked for her. The collectively authored re-view by Mary Pena and colleagues, titled Making Sensory Ethnography, reflects on the groups’ experiences of a workshop under the same name, as well as from an exhibition they organised, ‘Sensorial Formats’, and their involvement in Displacements, the virtual conference of the Society for Cultural Anthropology (SCA). The piece considers the possibilities that multimodal work opens up for collaborative multidisciplinary work and cross-disciplinary communication. Indeed, the re-view embodies such practices: it was authored as a collective, using Google Docs, from across seven different countries. Finally, Keira Pratt-Boyden reviews her participation in a workshop organised by University of Kent’s Centre for Ethnographic Research on the topic of ‘new ethnographic contexts and methodological innovation’ and with a focus on ‘creativity, imagination and performance’. In reflecting on the event Keira argues that ‘things which are new, or experimental in nature, are always going to be challenging, especially when they are embedded within complex debates about honesty, accuracy, fairness and representation in research’; an argument that resonates with us, and for which arguably this journal serves as a space to think through and play with the challenges, and to forge new idioms for theory and practice. The contributions to the récits section of this issue pick up on the issue of ‘honesty’ that Keira makes reference to, capturing our original intentions in creating such a space and giving it the name it has. The contributors explore the trials and tribulations of experimenting with multimodal ethnographic practice and representation, our issue’s second theme. What could possibly go wrong? Rebecca Webb asks rather poignantly in a question that is bound to resonate with many ethnographers as we remember both figurative and, in Rebecca’s case, actual moments of undoning and showing more than intended. The récits in this issue tell of stories of public embarrassment (Rebecca Webb), of injury and its serendipities (Deema Shahin), of the uncanniness of hindsight (Christopher M. Schulte), and of the doubts in the originality of images (Thomas Wochnik). The récits are all written in an evocative register using the full power of word and image to give us a sense of being there but also the visceral emotions generated by moments of perceived failure, surprise, and doubt. Yet, they also demonstrate the breadth of multimodality and what Mary Pena and colleagues in the re-view section refer to as the ‘many ways of inhabiting a body of knowledge’ and of making sensory ethnography. In particular, Rebecca’s choice of performance, as her opening debut to the primary school in which she would be spending a year, contrast sharply with more mono-modal approaches to presenting oneself to ‘a field’ through for example the use of information sheets or verbal descriptions of the research. Instead, Rebecca’s performance animates the role of the ethnographer and of her research drawing on a full range of props. Home is Where Mom Is, a biographically inspired multimodal project by Deema Shahin mixes portraiture photography and women-mothers’ stories of their lives and dreams. In describing her running accident in Malta, where she was based, and how this led to her meeting a new participant for her project, Deema reminds us of the ‘serendipity’ (Rivoal and Salazar, 2013) of ethnographic research. Christopher M. Schulte describes the sound of a school bell in a yard in a Swedish primary school. The bell, a familiar, routine and largely ignored sound, reverberates in Christopher’s account across the present and the past as he reflects on what and how we pay attention in the field. Finally, Thomas Wochnik, employing a autobiographical register of writing, recounts the politics of the image over time, in everyday life, across media and across generations. Wochnik explores the perception and consumption of images of self and the other, and how these change- or don’t, through and across time, technological developments, and intergenerational exchanges. A piece about the politics of the image, without any images, gives us pause to reflect on the textual, the visual, and the invisible qualities of images. Read together these récits form a meditation on time and temporality in multimodal ethnographic practice as that relates to the dynamics of destiny and chance as well as the longue durée of doing ethnography, something which mixing media makes more tangible through the entanglement of text, image and sound (see also van de Port, 2017). Ethnographic practice, artistic practice is rarely straightforward or seamless. These contributions capture the undoing, the falls, the surprises, and the wonder of engaging in multimodal research and/or being attentive to the multimodality and multisensory nature of the world itself. It would go amiss in this second editorial not to mention #hautalk, which has unfolded since our last issue and which has reverberated in the anthropological community as well as further afield. It is easy in a very public scandal to take sides and make declarations. Our reading of blog posts, twitter conversations, and attendance at EASA 2018 conference session on #hautalk, has left us with a strong feeling that what happened at Hau is a complex confluence of events, actions, dispositions and personalities, structural issues and much more. These are dynamics that go beyond the context of one journal and which many of us, ourselves included, at different points in time, in different contexts (departments, research groups, conferences) and to different degrees, have experienced. In ethnographic terms, #hautalk might be described as an event that made visible the structural inequalities and injustices of the contemporary academy and the funding and knowledge production landscapes it (and many others) operates in and reproduces, and for this reason it has resonated strongly with many colleagues. It is also easy in such a public scandal to disavow any knowledge of the dynamics being portrayed or to proclaim better, healthier structures from where one stands. As a new journal and new to the journal editorial role, it is hard to make such declarations. We can only outline intentions. As colleagues at the PrecAnthro collective put it, what happened at Hau may be ‘both a disappointment and an opportunity’ (our emphasis) and we stand together with colleagues in Cultural Anthropologywho raise the question of what kind of anthropology (and indeed, social science) we collectively consider to be important and relevant for the field and the future of training students (West, 2018). As such, we have followed closely, and are trying to learn from what happened so similar experiences are not recreated. We are in the process of drawing up terms of reference for the various editorial roles. As an editorial team we meet twice a year and we will soon be creating a small editorial board to further support the development of the journal and its emerging community of practice. In terms of content and to create this current issue, we used a mixture of approach and invitation; invitations to contribute to the journal were made at workshops on multimodal ethnography we organised and co-ran in the context of our other roles on the Connectors Study. Some contributions to this issue have emerged from these invitations, for others we were approached by authors following the publication of the first issue. Entanglements uses peer feedback to develop contributions and this is something we will be clarifying in our next editorial. There is much more to think about and put in place, but for now #hautalk gives us the opportunity to outline about what we mean by open access and how open access relates to this journal. We are open-access and free to our readers. We are not affiliated with a professional body. The initial start-up costs for the journal were financed by the European Research Council through the Connectors Study as an outcome of the study’s methodology and knowledge exchange aims. Moving forward these costs (web hosting mainly and printing of publicity materials, which are modest at the moment) will be covered by the editors, until a more sustainable funding source is located. The labour of the editors and production editor is voluntary, as Gurminder Bhambra described her involvement in Discover Society, another open access online magazine communicating sociological research, entanglements is also very much ‘a labour of love’. We do it because it is interesting to us and others, and because we care about and would like to build a community of practice that supports experimentation around multimodal ethnography. On the issue of voluntary labour we are in agreement with the editorial statement at MAT that says ‘we do not believe volunteer labour is inherently exploitative, but we are keenly aware of the potential for it to be’, and we endorse this awareness as a guiding principle in our ways of working and collaborating in this journal. We are committed to communicate and engage in dialogue with scholarship at all career levels, especially at doctoral and early career stage, from around the globe and not just from colleagues affiliated to (prestigious) higher education institutes. In fact we maintain that multimodality is not just the preserve of professional academic researchers and there is much to learn from engaging with colleagues in practice, writers, filmmakers and artists. Finally, in closing this editorial, we want to point out that we have now set up a Facebook page and a Twitter account. Through these we will be posting calls, articles, announcements and news of the journal, as well as all matters regarding multimodality – in ethnography and beyond. Please feel free to follow and circulate these! We hope that you’ll enjoy the issue at hand. We are always happy to receive feedback and thoughts, as well as to receive manuscripts and ideas for publications. See you again in Spring! Disclosure: The in common exhibition which Kirrily Pells reviews in this piece, was co-curated by the Connectors Study team, comprised of this journal’s editors Sevasti-Melissa Nolas and Christos Varvantakis, and colleague Vinnarasan Aruldoss. West, P. (2018). ‘Introduction: From reciprocity to relationality’, Hot Spots, Cultural Anthropology website, September 26, 2018. [Online] Available at: https://culanth.org/fieldsights/1526-introduction-from-reciprocity-to-relationality (accessed 09/09/2018).